Unless you’ve been living under a rock for the past decade, you’ll no doubt be aware of the rise of eSports. What started with small groups of geeky amateurs in the early to mid 2000’s, has morphed into a giant global phenomena, with many professional teams and multi-million dollar prize funds (and players who look like they’ve actually seen the sun and don’t still live in their mom’s basement). The most popular games in the early days included MOBA (multiplayer online battle arena) titles like Dota 2 and League of Legends, and first person shooter Counter-Strike: Global Offensive, in addition to Smite, StarCraft II, Call of Duty, Heroes of the Storm, Hearthstone, and Overwatch. Though by the end of 2017, many other games saw prize money in the millions of dollars. 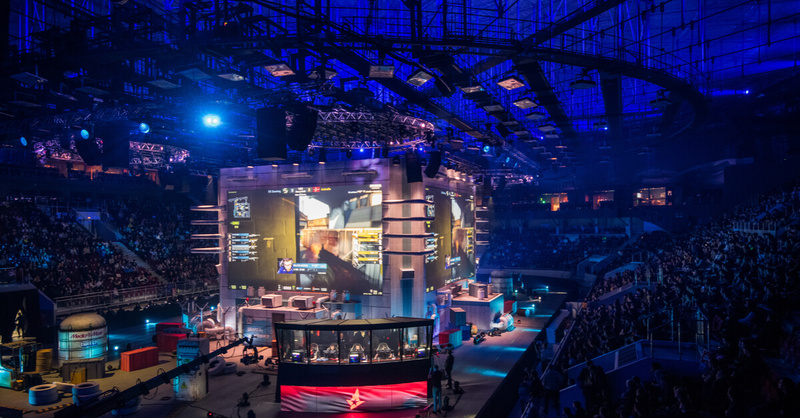 Back in 2013, it is thought that just over 70 million people watched eSports, but the rise of online streaming platforms, especially Twitch.tv, has led to a dramatic surge in popularity over the last few years, with Newzoo reporting market research that suggests there were around 150 million eSports “enthusiasts” around the world by 2016, and other estimates putting the global audience at around 226 million (the same research also estimated that 22% of male American millennials were watching eSports – making it about as popular as baseball or hockey with that specific demographic). In fact, in 2016, eSports events across America sold out, including those at the KeyArena in Seattle, the Nationwide Area in Columbus, Staples Centre in Los Angeles, and Madison Square Garden in New York. Global eSports revenues have skyrocketed accordingly, standing at $493 million in 2016 – up 51.7% from 2015 – and are expected to beat $1.5 billion by 2020. But, as impressive as the rise of eSports in the US and Europe has been, with the real epicentre of eSports is South Korea – where several eSports organisations have been licensing pro gamers since 2000! China has also seen explosive eSports growth over the past few years, with many new professional teams and competitions appearing. It’s hardly surprising that eSports are pretty much a millennial thing (the generation born from the early 80s to around the year 2000), given that they were the first to grow up with video games. What is more surprising perhaps, is the relative indifference that the established betting industry has shown to eSports, considering that millennials are now adults, with disposable income, and a passion for gaming! A closer look may provide clues to this indifference and slow reaction to eSports. Firstly, there is the inescapable fact that most established sportsbooks are run by ‘GenX’s’ and ‘Boomers’ – generations that tend to have a hard time accepting that eSports are actually ‘sports,’ or that people really make a profession of playing video games! Secondly, the sheer speed with which eSports have emerged as a major global ‘thing’ has been quite startling, and sportsbooks with established business models have simply been caught off guard. This has been exacerbated by the fact that many of the biggest bookmakers are based in the west, whereas much of the driving force for the growth of eSports has been coming from Asia – specifically South Korea and China. Thirdly, there are the peculiarities of eSports and millennials to consider. A large proportion of millennials won’t have had any significant exposure to sports betting – but are instead coming from a purely video gaming background. This means they have entirely different expectations and demands. To put it bluntly, most current sportsbooks are too bland and clunky to appeal to a generation raised on console games and on-demand interactive entertainment. To really engage this demographic, sportsbooks need to massively improve their graphics and user experience, gamify their product, and embrace artificial intelligence to provide real-time, dynamic micro-betting. Millennial eSports betters are more likely to make frequent small, spontaneous bets on live games, than to fill in traditional betting slips, or place sizable bets on pre-set markets. Of course, marketing and customer relations also need to evolve to cater for a generation raised on social media and almost immune to traditional advertising methods. The success of Steam – the digital distribution platform developed by Valve Corporation – that incorporates a thriving online gaming community into it’s very fabric, is a good indicator of the direction the industry should be moving in. Slowly the sports betting industry is waking up to eSports, and beginning to deliver something that will appeal to the rapidly growing eSports community. Whilst it’s true that eSports isn’t likely to rival football in terms of sheer popularity or statistics for many years, it is here to stay, is growing extremely quickly, and offers immense opportunities for fans, players, and the sports betting community as a whole. When eSports are considered as just a part of a of rapidly evolving online gaming, virtual reality, and blockchain technology environment, the possibilities for innovation and growth are pretty much limitless. Whilst the sports betting industry may have been rather slow in embracing eSports, there are signs that this is changing, and we can expect to see some very exciting developments over the coming months and years. It’s with this in mind, that EnergyBet, the multi-award winning sportsbook from the team behind EnergyCasino, now offer a range of eSports betting, including Counter-Strike: Go, League of Legends, Dota 2, StarCraft 2, Hearthstone, Heroes of the Storm, and Overwatch – all in an easy-to-use format that stands apart from traditional sportsbooks.